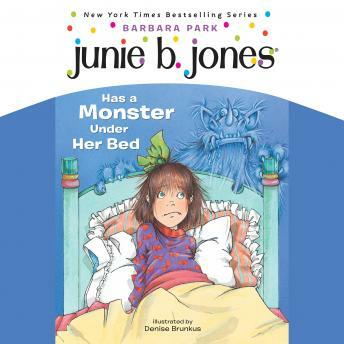 With over 50 million books in print, Barbara Park's New York Times bestselling chapter book series, Junie B. Jones, is a classroom favorite and has been keeping kids laughing—and reading—for over 20 years! In the 8th Junie B. Jones book, Junie B. knows there's no such thing as monsters. Mother and Daddy even said so. But then why is there monster drool on Junie B. 's pillow? Oh, no! What if Paulie Allen Puffer is right—what if she really does have a monster under her bed? If Junie B. goes to sleep, the monster might see her feet hanging down. And he might think her piggy toes are yummy little wiener sausages!